Turbo C Debugger – Very good – NO EGA!!!. 1) No fee may be charged for such copying or distribution. 2) TTCD may ONLY be distributed in its original, unmodified form. versions of TTCD. A limited version, and a full version. o Only "small" model programs can be debugged. o It does not support programs that use CGA or EGA graphics. o Only 300 global symbols are allowed. a program serial number, and a telephone number for support. routines supporting nearly all applicable UNIX "standard C library"
calls, and supports most of the (proposed) ANSI C standard. o All Turbo C models except "Tiny". o "Conditional" and "looping" breakpoints. o "Sticky" and "Non-sticky" breakpoints. o 8087 code, or floating point emulation. o Symbolic dis-assembly of program code. o Programs that generate CGA and EGA graphics. o TTCD.EXE - This is the TTCD program. o TTCD.DOC - Users guide for TTCD. compiling a program to be debugged with TTCD. that you have recorded and saved. o "Tiny" model programs are not supported. o Programs that use VGA Graphics are not supported. o Maximum number of global symbols is 5000.
o Maximum number of modules is 30.
o Maximum number of lines per module is 65000.
section 5 of this users guide. the cost of the phone call). availability call Pat at (713) 487-8379.
o OS/2 (when Borland produces a Turbo C for it). o Programs that generate VGA graphics. knowledge of 8086 Assembler is recommended. the wait for source code to be displayed. o Version 1.0 (or greater) of Turbo C.
o "Model": Any model except "Tiny". (NOTE: THE LIMITED VERSION OF TTCD WILL ONLY HANDLE "SMALL"
o "Standard Stack Frame": On. o "Use Register variables": Off. All other compile options may be set as desired. this is smaller, and faster to read. All other link options may be set as desired. breakpoints in must be compiled with the "Line numbers" option on. be available to TTCD if compiled with line numbers. to an .EXE file, but it will not execute properly outside of TTCD. properly, it does not have to be re-compiled. Where PROGRAM is the name of the .EXE file to debug (the "target"
current directory, on the current drive. automatically put in any graphics mode if this is specified. THE LIMITED VERSION OF TTCD. option is for use with programs that have more than 500 symbols. 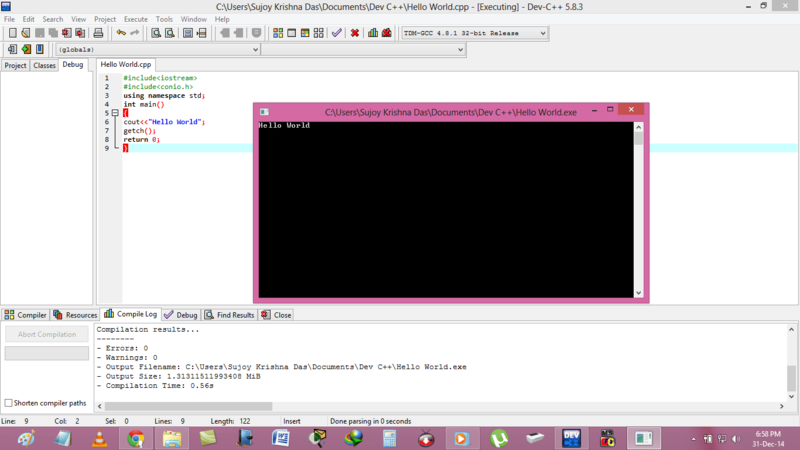 that it is reading the map file, and generating the ".DBG" file. Copyright (c) 1987 by SAYSoft, Inc.
Reading MCALC.MAP . . . Creating MCALC.DBG . . .
Press to abort, any other key to start. option on. The module table is set to 10 modules. lines in the modules compiled with line numbers. TTCD if only selected modules are compiled with numbers. actually using it to debug a program with problems. For a simple example, "MAC2TEXT" can be used to "test drive" TTCD. is to convert TTCD macros to readable text. Turbo C can be used to "test drive" TTCD. become familiar with them, and how they are used. Menus and prompts in TTCD are always on the top line of the screen. o We are in a source code module named "HELLO.C". o We are in procedure "main". o The next line to execute is source line number 16.
zero, its value is displayed near the left end. Options are selected by pressing the letter in the angle-brackets. displayed at the top of the screen or not. Each of the options on the main menu is discussed below. until actually cleared, or until the debugger is exited. "turning off" sets of sticky breakpoints selectivly. program execution the first time it is encountered. This option will allow you to set a condition for any breakpoint. is one of the registers listed in section 4.2.4.1.
or array member, its address must be specified. is an address as specified in section 4.2.3.7.
the menu in 4.2.1 to complete the breakpoint setting. to break the first time we reach line 5 of the current module. we get to "display()", which ever occurs first. break before execution of that line. breakpoint will be set to break before execution of that procedure. automatically anytime the debugger menu returns. be evaluated, or press to return to the menu. specifications), and a 'type' as described in section 4.2.3.6. When entered, the value at the specified address will be displayed. displayed with '()' following the name. 32 bytes above the current frame (where function parameters are). frame with BP as the frame pointer. displayed as a 'double' floating point number. are displayed as a floating point number. displayed. See section 4.2.3.8 for examples its use. ellipses (. . .) following it. value after repeated race or o commands. Offset is a constant, a register, or a register +/- a constant. Segment is a constant, or a segment register. well as the isplay lobal command. displayed using the isplay lobal command. The nter command allows you to change register or memory values. When a register name is entered, you will be prompted for a value. byte will be set into the register. up to 3 hex digits. o "\felix" is 5 characters. They are: '\f' 'e' 'l' 'i' 'x'. The '\f' is taken as a formfeed character. o "\0felix" is 4 characters. They are: '\0fe' 'l' 'i' 'x'. The '\0fe' is taken as one character (0xfe). o "\00felix" is 5 characters. They are: '\0f' 'e' 'l' 'i' 'x'. The '\00f' is taken as one character (0xf). o "\000felix" is 6 characters. They are: '\0' 'f' 'e' 'l' 'i' 'x'. The '\000' is a null character. will be put in memory starting at the specified address. The o command allows executing the program to a certain point. reakpoint, the debugger menu will return. receive a 'Line not found' error message, use the next line number. compiled with the 'line numbers' option on. lines) may be listed by pressing . too long to fit on one screen line. stating '' will be displayed. NOTE: Tab expansion is every 4th column, not every 8th. This option will allow you to specify the eep variable by name. type is selected, the variable value will be added to the "keep"
area at the bottom of the screen. This option will allow you to specify a memory location to eep. type is selected, the memory contents will be added to the "keep"
to the "keep" area at the bottom of the screen. directory, it will be loaded automatically. Each option is discussed below. must be in the current drive and directory. be asked to press the function key you wish to assign the macro to. playback when the specified function key is pressed. o Only the keys entered into the debugger will be recorded. o Up to 99 key strokes may be recorded in one macro. o Function keys are ignored during macro recording. o Macros may not be nested or linked. of the trace mode in order to finish recording the macro. "TTCD.MAC" will be re-loaded the next time TTCD is executed. "debugger screen" will be swapped between each statement traced. If it is set to OFF, some target program screen I/O may be lost. is in a graphics mode. This option may also be toggled on or off while in the trace mode. screen switching will be much faster in the text mode. of the mode, however, many CGA cards have this problem. ended, pressing will exit TTCD immediately. output will go to the printer as well as the screen. any key will return to the debugger screen. for a description of command line options. roc step tracing. When selected, you will be asked the speed. roc step to start execution. trace mode and return to the main menu. tracing with the following line. an arrow pointing to it). segment may also be specified, such as "a6d00:0174". procedures, while 'currow', 'curcol', and 'autocalc' are variables. commands, and is a very powerful command option if used properly. The repeat count is displayed near the left end of the status line. breakpoint is set will cause the breakpoint to be "ignored"
breakpoint will return control to the debugger. if the display type is ex or tring. specified line or procedure N-1 times. The default is 1.
will return to the debugger main menu. listed each time is pressed. The default is 5.
abnormally), the message "Execution Terminated (return value=%d)"
is counted as a separate statment here. o Put 'else' statements on lines by themselves. of the code easier to trace. (such as "BYTE" or "WORD") are only used when required. TTCD may lose control of the target program. a reakpoint, oto, or nassemble. compiler keeping some variable values temporarily in registers. command to display register values. if you are new to TTCD. process-spawning routine really does run out of memory. Terminated" when the target program did not attempt to run at all. traps a "timed" interrupt vector. still maintain control of it. changes this vector, TTCD will "lose control" of execution of it. the input string when is pressed. erasing characters as it goes. but do not erase characters. Move the cursor right in the input field. Move the cursor left one word. Move the cursor right one word. the beginning of the input field. the end of the input field. it will be cleared automatically. if the letters do not match exactly. value, or a segment register in the address expression. CS - If the address is 'code' related. SS - If the address expression contains SP or BP. DS - All other addresses. 0 Color of non-highlighted menu characters. 1 Color of highlighted menu characters. 6 Color of main debugging area. 7 Color of traced lines. 8-19 Reserved for future use. 20+ Extended key codes for each of the 10 macro keys. program, or a hex file editor.